The traffic congestion on Route 28 is unacceptable, and the Route 28 Corridor Feasibility Study is underway. The Northern Virginia Transportation Authority (NVTA) and Commonwealth Transportation Board are poised to fund widening Route 28 in Fairfax, creating new interchanges to eliminate stoplights – and potentially a brand new highway extending Godwin Road over Bull Run. The new four-lane highway is the obvious preference of the Department of Transportation in Prince William County. The county’s transportation officials see more-bigger roads as the solution to every mobility problem, and endorse every highway that can be sketched on a map. Fortunately, the process to get Federal funding requires public involvement and the consideration of alternatives beyond the preferences of county staff. More lanes and fewer traffic lights are obviously part of the solution, but building a new road across Bull Run is not. Best place to start before spending hundreds of millions on a new road: define the problem. There are two separate solutions to those two problems. Widening Route 28 north of Bull Run in Fairfax where the corridor has been planned for more lanes, and eliminating stoplights with revised interchanges and overpasses, will speed traffic between Manassas and I-66 significantly. South of Bull Run, the potential to widen Route 28 between Manassas-Yorkshire is limited by the number of commercial operations on either side of the road. Destroying businesses in Manassas/Manassas Park/Prince William, so commuters can drive to jobs in other jurisdictions, will not help the local tax base or local employment opportunities. It may be feasible to re-engineer some of the frustrating interchanges in Manassas, Manassas Park, and Prince William to minimize the delay from stoplights. The best way to get the traffic to bypass Manassas is… (drum roll, please) use the existing Route 234 Bypass to bypass Manassas. Traffic coming north from Fauquier County can go 5 miles to reach I-66 via the Route 234 Bypass. That road is planned to be a 6-lane highway with overpasses between Route 28 and I-66. Even if Option 2B was built to German autobahn standards, the 5-mile drive via Route 234 Bypass will always be quicker than the 9-mile drive via Route 28 at Centreville. The goal is to get vehicles to I-66, right? Express Mobility Partners is spending $3 billion or so to upgrade that interstate to move traffic. Route 234 Bypass is a straight shot from Route 28 to I-66. In contrast, Option 2B would be a long, winding road. It would be slower for drivers, and waaaay more expensive for taxpayers. And why would we want to stick even more cars on Route 28 north of Bull Run? With Option 2B, 8 lanes of traffic would have to squeeze into the 6-lane Route 28 corridor in Fairfax County. That would just create a new bottleneck and create more congestion on the route to Centreville. Eliminating stoplights on the Route 234 Bypass will help make Innovation more attractive for development. The Innovation site is intended to be a place for businesses to bring jobs to Prince William, and to evolve into a live-work-play center – so let’s invest there. We can divert traffic away from the chokepoint of downtown Manassas without building a new road across Bull Run. No houses, no wetlands, and no historic Civil War battlefields need to be destroyed by constructing Option 2B. When the environmental analysis of the “Fix Route 28” proposals gets serious, transportation planners will be confronted with Section 106 of the National Historic Preservation Act and Section 4f of the Department of Transportation Act of 1966. Both require close examination of feasible alternatives before blasting new roads through parks. The Civil War Trust and NOVAParks have already made clear their objections. Option 2B is not the answer. There is a clear alternative: improve the existing Route 234 bypass to bypass Manassas, rather than build a new highway cutting through neighborhoods, sensitive riparian areas, and the 1861 battlefield. If “Transform I-66” Is Supposed to Create a Multi-Mobile Corridor – Ugh, What About Bikes and Pedestrians in Prince William? Good vision – except the non-motorized part in Prince William is all hat and no cattle. The project’s contribution to a shared use path west of Fairfax County is just a few lines on a map. Dotted lines for “duh, don’t know who might ever make this a real trail” cross Bull Run. Unless you’re paddling a bike with a swim bladder, that dotted line means end-of-trail-and-start-of-platitudes-and-promises. East of Bull Run, there’s real money being invested in building a trail suitable for pedestrians and bikers. West of Bull Run… nada. The Prince William Conservation Alliance supports the planning and construction of bike/pedestrian paths in the I-66 corridor as part of the Transform I-66 project. 1) The proposal to end construction of multi-mobile paths at the Fairfax County border, excluding Prince William County, is short-sighted and inadequate. The I-66 project should provide a bridge over Bull Run to facilitate a connection from Fairfax County to Balls Ford Road and Vandor Lane. 2) The Transform I-66 project should construct a bike/pedestrian path where I-66 crosses over Route 234 business. Building new infrastructure at that overpass, without creating a bike/pedestrian path linking the southern and northern sides of Route 234, would be transportation planning malpractice. Currently, I-66 isolates the Northern Virginia Community College and Manassas National Battlefield Park from the development on Sudley Road. Pedestrians and bikers going from the City of Manassas to the community college or park visitor center must go far out of their way to Groveton Road, in order to get across I-66.. It would be flat wrong to build more bridges which would perpetuate rather than correct the problem at the Route 234 Business overpass. The City of Manassas mothballed its parks management operation during the 2008 recession, but it’s coming back to life. In 2016 it completed a Parks, Recreation and Cultural Needs Assessment and Facilities Plan and a Master Plan for Dean Park. In 2017, the city started a plan for Stonewall Park. The planning has defined “Levels of Service” for active recreation. The city has identified how many more ballfields, basketball courts, etc. are needed as the population grows. The challenge is not a small one. What’s missing, so far, is the recognition that the city also has natural resources to protect in its parks. The initial proposal for Stonewall Park would clear some of the mature forest there, with trees perhaps 75 years old, to add a rectangular ballfield. Stonewall Park is not a wilderness area, but it’s special. Not many places in Manassas offer a chance to walk underneath a canopy of old oak trees. The forest at Liberia is much younger, for example. Cannon Branch Fort also offers a rare experience to walk in the woods in a city park There are still some trees left along Winters Branch, despite the recent city project to armor the streambank with stones. At Stonewall Park, he city has the potential to consider how to replace the non-native Bradford pear trees with species that support wildlife, especially birds. Manassas has many back yards that offer a specific type of habitat and attract specific types of birds, but the city has few places that support critters that rely upon forest habitat. 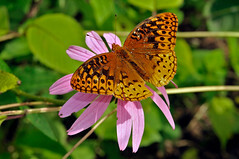 The plants the city installed around the parking lots, when the park was first developed, are only slightly better for native birds and butterflies than the cell tower disguised as a tree. 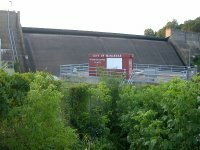 Manassas could also look into options for improving stormwater management at Stonewall Park. Currently, runoff from the park carries pollution downstream with no controls. It’s one reason Bull Run is on the state’s dirty water list of impaired streams. Runoff from the urban area also puts the Occoquan River, Potomac River, and the Chesapeake Bay on that dirty water list. Ugh. It’s still early in the planning process for Manassas parks. City staff and elected officials seem receptive to comments. If you want the city to inventory its natural assets and manage the trees as much as the ballfields, now is a good time to say what you want – submit your comments regarding Stonewall Park. What’s Happening at Silver Lake? That is what one recent visitor to Silver Lake Regional Park in Haymarket commented, as she walked to the platform on the shoreline. She saw a landscape of mud and old trees, with leaves rotting away at the bottom of what was once a beautiful lake. Silver Lake has been drained for a dam rehabilitation project. Like all construction projects, it is aesthetically chaotic, even ugly. 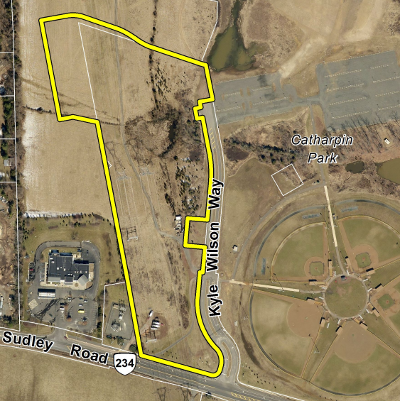 It does not resemble the “jewel in western Prince William,” as promised when the county decided to have the Park Authority manage the 230-acre site in 2009. 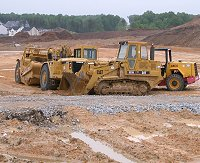 Prince William County government has a reputation of bulldozing first and checking for natural and cultural resources after the fact or not at all. Two citizen members of the Historical Commission resigned in protest last September, after the county decided to build a fire station on top of a family cemetery. At Silver Lake itself, the Prince William County Department of Parks & Recreation has ignored the presence of vernal pools essential for frog and salamander breeding, and expanded a horse trail to create a dirt road for patrol vehicles through that special habitat. However, in this case the draining of the lake is both essential and temporary. The 29-foot high earthen dam at Silver Lake is classified as having High Hazard Potential. It must be reconstructed to conform to Virginia’s Dam Safety Regulations. The spillway is being replaced so a heavy storm will not cause the dam to break and flood homes downstream. The lake has been lowered to construct needed control structures and provide additional storage to prevent flooding. There are concerns about impacts to aquatic life; the lowering of the water level during the winter months was intended to help minimize those impacts. Work on the Silver Lake dam is expected to be completed in June 2016. Cost is budgeted at $2.5 million. Just before Thanksgiving, the Manassas City Council killed the latest initiative to open Lake Manassas to fishing and non-motorized boating. This issue will come back. Maybe not this year, maybe not next year but there’s no way that a resource like that in an area like this with the sense that it makes to open it up to public use will be denied for too long. At some point, savvy politicians will identify how public use could provide benefits (or lower costs) for Manassas, and the issue will be re-opened. Recreational opportunities in still-suburbanizing Northern Virginia are valued, and locking up the lake will be recognized as excessively restrictive. Members of the city council in Manassas will change over time. The last vote blocked a study that would have identified the risks and analyzed potential impacts of public use. The FUD campaign (fear, uncertainty, and doubt) to keep the lake closed may continue without any additional facts, but at some point the risks will be put into perspective and different city officials will reconsider the decision. 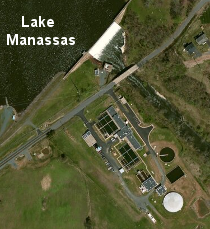 Tonight (November 12), the City of Manassas Finance Committee considered a proposal to study the risks involved in opening Lake Manassas to public use. The vote was 2-1 to reject funding a $45,000 study, but the entire City Council will consider it on November 24. The lake remains closed to public use, with $80,000 or so spent annually for the city police to patrol the lake and issue trespass citations. Even adjacent property owners are banned from putting a canoe on the lake. Members of City Council have expressed fear, uncertainty and doubt about the safety of the water supply if public use was allowed. Fairfax Water long ago decided that public use was OK; it permits boats and fishing on Occoquan Reservoir. Even motorboats zip across Lake Jackson, located between Lake Manassas and Occoquan Reservoir (and part of the water supply for Fairfax/eastern Prince William). A scientific study could answer the questions regarding the risk of public use, and put those risks into context. The City Council should also consider the benefits of advertising Manassas through the lake. In 2011, the city spent over $625,000 to support the 150th anniversary of the Battle of First Manassas. Manassas collected less than $50,000 in increased taxes from that event – less than 10% of its investment – but also calculated $240,800 in “publicity value” from the broadcast coverage (and additional value from print, radio and internet reports). this look like a park? Now we know – the county’s Parks and Recreation Department supports converting publicly-owned parkland into a bus parking lot and garage at Catharpin Park. The parks people think building a JiffyLube on steroids is a perfectly fine use of public parkland. Local residents are opposed. All county residents should be disappointed. If you care about Dove’s Landing, you should be alarmed. What could the county develop at Dove’s Landing? The county could, “naturally,” endorse another garage and bus parking lot on parkland. A new low-income public housing development ? Hey, it’s a public use, a different county agency might want it, so housing could be A-OK with the Parks and Recreation Department and the Board of County Supervisors. You say Dove’s Landing is protected ‘cuz it is in the Rural Area? No problem – so is Catharpin Park. After a Public Facility Review, the supervisors can approve anything, anywhere. If an industrial garage is acceptable at Catharpin Park, what is not acceptable on other parkland? An office building for the Department of XYZ, instead of ballfields? A specialized landfill for demolition and construction debris, instead of a waterpark at Andrew Leitch? If there are no limits, then anything goes. The only way to protect parkland in Prince William County is with enforceable conservation easements. Signing an easement that limits the ability of the supervisors to approve anything, anywhere, is not a new concept. The county has such easements on its historic sites and on some parks purchased with Federal funds. The Park Authority cut a deal with Angler Environmental to restore stream segments and create the Prince William Environmental Bank with permanent conservation easements. Two county-owned parks are especially at risk: Dove’s Landing and Silver Lake. Both sites are currently intended for passive recreation uses and would qualify easily for protection under easements accepted by the Virginia Outdoor Foundation – at no cost to taxpayers. When the county converted the Park Authority into the Parks and Recreation Department, the Board of County Supervisors gave $50,000 to a land trust based in Fairfax County to “protect” the restored stream segments. The benefit of that deal are questionable , except for political purposes. County residents (and clean water resources) would be protected better if supervisors directed staff to pursue Virginia Outdoor Foundation conservation easements for Dove’s Landing and Silver Lake. Conservation easements would ensure that our two largest, undeveloped parks in Prince William are permanently preserved, and can not be converted into industrial sites or other inappropriate uses. The “Open Space” Fraud Begins at Stone Haven – Hmmm…. Think It Will Continue Into the Rural Presevation Study? Are parking lots “open space”? Really? Land that is not dominated by man-made structures. It preserves natural or cultural resources, provides for passive recreation, is used for cultivated fields or forests, or exists in a natural and undeveloped state. Open space may include nature preserves, historic sites, farms, parks, forests, floodplains, wetlands, etc., and may include some structures, parking areas, roads, trails and facilities that support the use of the land. “Some structures” is being interpreted so loosely by the Planning Department that the parking lot at Wal*Mart would qualify. For example, the Stone Haven development application is proposing 1,650 homes and more than 1 million sq. ft. of commercial space on 864 acres between Linton Hall Road and Nisson Pavilion. The site is currently dominated by an established forest, where 35 specimen trees (typically, trees with a diameter greater than 30″) were found. Only 16 are proposed for protection and much of the promised open space does not meet the County’s definition. Citizens need to fight the Planning Department (and often the elected supervisors…) to get a fair share of parkland, as new developments are approved. The proposed update to the Comprehensive Plan in 2006 pretended everything was just hunky-dory and business-as-usual was just fine, while the county’s population swelled far faster than the number of ballfields or opportunities for passive recreation. Such an inventory is still missing in action, and the Planning Department is wheeling back to the bad ol’ days of “anything goes, Prince William has no standards, and even guidelines are loosey-goosey” development. The Planning Department is trying to create an open space loophole through which developers can maximize “yield” and profits from their projects, while the taxpayers are stuck with the bill. The supervisors are requesting an extension of the time to sell bonds approved in 2006 to pay for parks and open space, as well as libraries and roads. You’d think the elected officials would also seek to obtain at least the minimum proffers for public facilities as new developments are approved so the taxpayers don’t subsidize the for-profit developers, but the Planning Department is undercutting that approach. Which of the following do you think meet the official county definition of “open space”? It’s a fraud, unless you think the proposed bus parking lot next to Catharpin Park is no different from the park itself. Yeah, the entire acreage dedicated to a middle school, including buildings and parking lots, is “open space.” Really. So is that 15′ wide strip of grass between the road and the parking lot. When you walk through the doors of Chinn Recreation Center, you’re not indoors – you’re walking into open space, as proposed by the Planning Department. Really. It took less than a year for the Coles District supervisor to act on the opportunity to open up the Dove’s Landing parcel to public use, after magisterial district boundaries were redrawn to shift the parcel from the Brentsville District. On August 7, 2012, the Board of County Supervisors committed $100,000 for Dove’s Landing from the 2012 carryover funds. No details were provided in the motion, so it is not clear how the money will be used. $100,000 is a nice chunk of change, extracted from the taxpayers and allocated in an opaque budgeting process that has drawn severe criticism. Getting money through a budgeting technique that lacked transparency or citizen input, for a project with no plan or performance measures, is far from ideal. Still, it’s long past time to address the county’s need, as highlighted in the Comprehensive Plan, to provide recreational opportunities beyond ballfields. With $100,000, Prince William could do some real good, or some real damage, to Dove’s Landing. The county could, for example, repeat its experience at Silver Lake. Ugh. September 17, 2014 — Manassas City Council Work Session planned for September 23, 6:00 pm at Manassas City Hall, 2nd floor conference room. Scheduled at the request of Councilman Marc Aveni, this work session will focus on opportunities for public access to Lake Manassas for fishing and nonmotorized boating. Be there! June 29, 2011 — The Manassas Patch has an entertaining tale of a angler who was fishing from the shoreline of Lake Manassas, when confronted by the county police. The opinions expressed here and in corresponding comments are the opinions of the authors and do not necessarily reflect the views of Prince William Conservation Alliance. PWCA is a nonprofit watershed organization working to conserve and restore waterways and natural areas, and increase community participation in stewardship opportunities. We invite you to join us.